Bodhgaya, India -- It's not everyday that you get to sing the Thai national anthem and other songs at the top of your pitch in India, Bodhgaya to be precise, where Lord Buddha attained enlightenment. With a senior monk leading the chorus, our group of 60 or so Thais joined in, straining our lungs in a show of nationalistic zeal that - had the Enlightened One been hearing - would have certainly left him amused. << The Indian version of Daibutsu at Bodhgaya in the state of Bihar. But thousands of other devotees at the Buddhist holy site seemed unperturbed by the commotion we created. They probably thought we were chanting prayers in Thai (although it might have puzzled them to see us stand at attention). Bodhgaya is a United Nations of sorts for Buddhists the world over. This World Heritage site now attracts hundreds of thousands of visitors from Sri Lanka, Burma, Korea, Malaysia, Singapore, Thailand, Laos and Cambodia, as well as from some Western countries. If you travel with Thai Airways' special Royal Orchid Holiday package like we did, this is also the very first stop on their recently opened route tracing Lord Buddha's life. You will be able to have a glimpse of the place he was born, embarked on his spiritual quest, taught his first group of disciples, and finally departed from this world and its endless cycle of samsara. 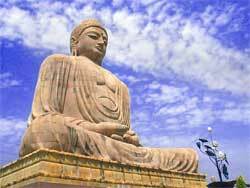 The proximity of Bodhgaya (also called Bodh Gaya) to several key religious sites in the Indian state of Bihar offers a few advantages. Unless you plan to do serious meditation near the Tree of Enlightenment, at least a day should be devoted to a trek to and around Rajgir, about two hours' drive from the temple. This bustling town is close to the world's first Buddhist university of Nalanda and the first monastery of Venuvana built by King Bimbisara, a major patron and follower of Buddha during his lifetime. On the day of our visit, however, reports of imminent riots there prompted our tour organisers to adjust the day's itinerary: we were advised not to travel beyond the outskirts of Bodhgaya. The alternative programme proved to be as much enjoyable and educational: the unexpected experiences that presented another face of India that somehow changed our impressions of the sub-continent and her people by a couple of notches. So instead of Rajgir, we headed to a stupa built in tribute to Sujata, a maiden who offered food to Buddha before he attained enlightenment. There were beggars everywhere and in throes too. Our guide said Thai tourists seem to be the most popular targets of these clever, determined folks. Curiously, they approached us with an odd mix of plaintive songs, repeating over and over the familiar prayers in Pali like Phuttang saranang gaccami (May we take refuge in Lord Buddha) and so on. But during a jaunt from the Sujata stupa to nearby Niranjana (also known as Falgu) River, a friend and I lost track of the rest of our group. So for a long while we wandered around on our own in a small village, feeling at once a little anxious and adventurous. Interestingly, the presence of two foreigners did not cause any rush, or pleas for money or to sell things to us. There were stares of curiosity, a few hellos, and the waving of hands. Indeed, that morning was one of the most peaceful times we have had in India - when we could put down our guards, not having to doubt another person's motives. Eventually, a boy with rudimentary command of English offered to guide us back to the tourist bus. Other places worth visiting (in case you have time and/or are bound to keep close to Bodhgaya like we did) are the 50-year-old Thai temple, the headquarters of all the Thai Sangha in India, a local museum with its small but marvellous collection of stone sculptures, and last but not least, the Brahmayoni Hill where Lord Buddha gave the Fire Sermon (Adittapariyaya Sutra) to the 1,000 fire-worshipping ascetics, who all became enlightened while listening to the discourse. The climb was arduous but the views at the top are almost heavenly. During the seven-hour bus ride to Kushinagar, we were treated to both visual and spiritual feast. From the windows, the spectacular sights of Uttar Pradesh state: the vast golden plains of barley, water buffaloes and cows freely roaming the streets. Inside the air-conditioned bus, our guide, the honorary Phra Maha Noi (Preecha Katapunyo) delivered saucy dharma-tainment lectures almost non-stop. One of the key men at Wat Thai Kushinagar Chalermraj, Phra Maha Noi recalled the first years of sweat and tears as he and fellow monks tried to build the Theravada community there. Several anecdotes he shared were humorous in retrospect. At present, the temple in Kushinagar, like other Thai temples in India, has been involved in various social activities, including the provision of free medical service to local residents regardless of their religious affiliations and a hospital slated to open by the end of this year. The middle-aged monk invited us to contemplate on how revisiting an old relic, a stone or a tree, could guide us toward the spirit of Buddha. Underneath the physical poverty of India, Phra Maha Noi noted, there is the rich soul of people struggling to live with little, and demanding little from life and the earth. Thus genuine dharma can be learned everywhere if we keep our (inner) eyes open, he said. Compared to Bodhgaya, Kushinagar was far quieter, though inspiring no less awe in the visitors. Our guidebook made special mention of the ten-foot-long Buddha statue in lying posture in the main Nirvana Temple. The sculptor has done a wonderful, inimitable job of the Teacher's face: it looks joyful when facing directly, in suffering if viewed from the middle of the body, and unworldly serene from the position of his feet. Among a number of us an inexplicable feeling of pathos welled up as we prostrated on the ground at Buddha's feet, in gratitude to his tirelessly work for mankind and in showing the path toward peace. After that it was another four-hour ride across the border to Lumbini in Nepal, the birthplace of Lord Buddha. Will the process of rebirth be as quick as this? Anyway, the Nepali government has turned the holy site into a huge spiritual park allowing Buddhist nations to set up temples there. Local villagers are also offered tax rebate as one of the incentives to set up communities around Lumbini. 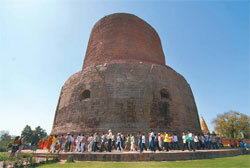 << Sarnath, the place where Buddha taught the first five disciples. But one infrastructure yet to be improved is the road, especially at the border checkpoint. During rush hour, a mere two-kilometre ride can take a couple of hours to negotiate. Roads in Nepal are truly one of the world's wonders. Forced by circumstances, the two-lane road had turned into five lanes as we approached the checkpoint, crammed with cars, motorcycles, jeeps, rickshaws, bicycles and pedestrians - some with goats in tow. Our driver had to summon all his skills to manoeuvre past the maze of chaos to the other side of the border, while we pilgrims made sure we didn't lose our cool during the trying circumstances by reciting prayers in Pali, with Phra Maha Noi leading the way. It was probably the longest prayer we would ever be making in this lifetime, given that it spanned the length of two countries. Lord Buddha's words of wisdom sounded so peaceful that I soon fell asleep. And before I knew it, Nepal was already behind us. We're in India again for another ten-hour journey to Varanasi and Sarnath, the last stop of our pilgrimage. Varanasi, the can't-be-missed holy city of India, was as charming as we expected it to be. Our organisers had thrown in a morning boat ride on the Ganga River which proved memorable before we headed to Sarnath, about eight kilometres away. 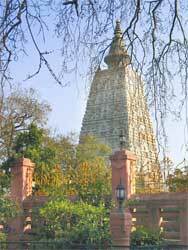 Buddhism as we know it today was born in Sarnath, once a lovely grove where Buddha taught his first five disciples. Besides the archaeological sites, Sarnath boasts a museum that showcases arguably the world's most beautiful Buddha statue (as our guide claimed and I totally agree with him), and one of the original King Ashoka's famous pillars depicting the four lions at the top, India's national symbol. It's a pity we had very little time left to stroll around the impressive collection of Buddhist artworks there. But there was still enough time for some more singing in front of Sarnath's main stupa. After that one last act, each member of the tour group was presented with a certificate signed by the abbot of the Thai temple in Kushinagar as proof that we had visited all the four Buddhist holy sites in India. On the paper are words by Lord Buddha: "When you see the dharma, you will see me." India certainly has plenty! Typically, a cheap way to visit Buddhist holy sites in India and Nepal is to contact the Thai temples there in advance. They provide modest but clean accommodations. Visiting pilgrims can also make donations to various charity programmes sponsored by the temples. The Wat Thai Buddhagaya, the oldest Thai temple in the sub-continent, has a useful web site with links to other Thai temples. Visit http://www.watthaibuddhagaya.com for details. Bangkok and the Indian towns of Bodhgaya and Varanasi. Its Royal Orchid Holidays also runs a special packaged tour to the four Buddhist holy sites in India and Nepal during the period. For more information, visit http://www.thaiairways.co.th. Also, to celebrate His Majesty the King's 80th birthday this year, THAI is inviting the public to donate their mileage that will be used to fly Thai monks to Buddhist holy sites in the two countries. For details about the "Miles for Merit" programme, call 02-2784022.